Smooth Texas jazz featuring piano and urban vocals. Big, grand and bold original compositions featuring funk edged grooves and melodic vocals. 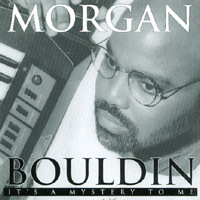 In multicultural Houston, keyboardist and native son Morgan Bouldin has survived professionally by being not only talented but flexible. It's a quality the fickle business of music often demands, even of its best practitioners. But listening to Wide Open Spaces (Heart Sound Records), Bouldin's new, tastefully smooth jazz CD, one might never imagine the musically varied path he has navigated to arrive here, at this Japanese restaurant beside the Southwest Freeway. For two decades Bouldin has adapted his skills to fit any opportunity, and in the process, he has served in numerous ensembles specializing in vastly different genres. His résumé includes quality time in pop (Shang), R&B and funk (Bachelor, Strangelove), reggae (Island Time), Tejano (Little Joe y la Familia), blues (Texas Johnny Brown, I.J. Gosey), gospel (pianist at Macedonia Missionary Baptist Church) and jazz. As a result, Bouldin has performed many kinds of music in many kinds of places -- in humble joints and grand concert halls, mall bookstores and upscale nightclubs, barbecue smokehouses and Tex-Mex ballrooms, holy sanctuaries and happy-hour lounges. The wide range of styles and venues reflects not only his impressive polymorphic capabilities but also his hometown's diversity. And that connection is perhaps epitomized by one of his more recent affiliations. These days the 40-year-old musician has found a regular twice-weekly niche at Tokyohana Grill & Sushi Bar, a Greenway-area restaurant that describes itself as the home of "Texas-style Japanese food." You read right. In addition to the fresh sushi, the place emphasizes teppanyaki cooking, in which amazingly dexterous chefs serve up hibachi-grilled meats in portions sizable enough to satisfy the heartiest Lone Star appetite. And if that fused culinary concept isn't enough, consider that the dominant soundtrack here, at least on the nights Bouldin plays, is a sound he defines as "groove jazz." "We've been there for over two years," he says. "From a musician's standpoint, it's the best gig in the world, because we do whatever we want to do. It's relaxed, no pressure, and we have fun." Indeed, a visit to Tokyohana reveals a delightful hodgepodge of contradictions that somehow, collectively, make perfect sense. For starters, the decor incorporates some traditional Japanese motifs, an artfully designed waterfall with a bonsai tree centerpiece against a backdrop of delicate bamboo, while also featuring Western elements such as full-size cushy chairs (no pillows on the floor here) and hefty wooden tables. But the most telling concession to American ambience is the rollicking atmosphere. As explained by proprietor Harold Soo, a 28-year-old Malaysian immigrant who founded the restaurant with his older brother Akin, "People usually go to Japanese restaurants expecting typical traditional things, a style that is alien to most Americans. But here we want it to feel comfortable, kind of like their home." That concept has led Soo to do something unique among Asian eateries, at least in the Bayou City: book a jazz act. "Most Japanese restaurants are kind of bland -- no entertainment at all. I wanted to bring in more American style," he says. "And jazz music is the first American music, so I wanted to bring it in....I did not know if it would be successful or not, so I just tried." After a month or two of experimenting with other players, Soo eventually hooked up with Bouldin, and the relationship soon evolved into a happy symbiosis. Since then, every Friday it's packed. "The people like to dance and have fun, and they love the music," Soo says, adding with a laugh: "But we usually don't let them sing; this is not a karaoke bar." Manager Michael Bua concurs that Bouldin's keyboard stylings, usually accompanied by Milford Spivey's elegant fretwork on seven-string bass, are a big draw. "A lot of reservations that we book ask specifically if Morgan is going to be playing that night," he says. One of the table cooks at Tokyohana, an African-American named Dewayne Washington who fits comfortably into this multicultural environment, is a special friend of Bouldin's. The musician introduces Washington over the PA system as "Easy Money." Clanging his cooking utensils in a rhythmic frenzy, the young chef enthusiastically bobs his head and shoulders, almost dancing, while Bouldin improvises a series of organ riffs. And in a weirdly wonderful way, the food preparation and the jazz coalesce. "I'm as much an entertainer here as I am a chef," Washington declares during a break. "And I just love the music. It adds so much to it all. I can get into the beat and keep on going." An 18-month veteran of the Tokyohana scene, he further confides that he was raised in the working-class South Park neighborhood and never dreamed that one day he'd be "the only black guy in Texas working as a Japanese chef." Then again, Bouldin, despite his highly diversified background, never imagined that he'd discover a home base in a Japanese restaurant. But he's happy to have it. After all, it's a stable gig that allows him to experiment with new ideas or revert to proven favorites, depending on his mood -- all the while cultivating his evolving appreciation for sushi. "I know there's nothing new under the sun," Bouldin says. "I'm basically trying to express myself through jazz, but my roots are really deep in R&B, funk and blues. So that's the way I approach everything I do. I really try to concentrate on interesting arrangements of original material that is accessible to regular people."